Individually manufactured metal articles are strikingly convincing. Thanks to their good looks. And thanks to their good price/benefit ratio. The many uses and the durability of metal are obvious. 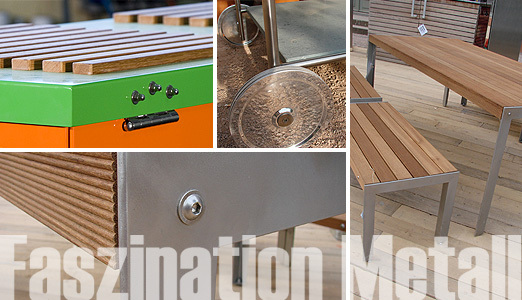 We at “Faszination Metall” also draw the attention to the aesthetical benefits of metal. In combination with sturdy wood or stone, creativity knows no bounds. We follow our inspiration, always looking for new areas of application. That’s how innovative products come to life – manufactured by hand, ideally suited for life in the garden and around the house – standing the test of time and weather just like a price comparison.